Police officials in Prince William County are praising officers for their bravery after they were shot at by a man with a rifle Sunday evening in an attack the police called an "ambush." Officers were responding to a call about shots fired in the 1100 block of Laurel Street in Woodbridge, Virginia, Sunday evening when a man began firing at them with a rifle, Prince William County police said Monday. During the gunfire exchange, a police cruiser was struck multiple times, and investigators also believe other homes in the area were struck. 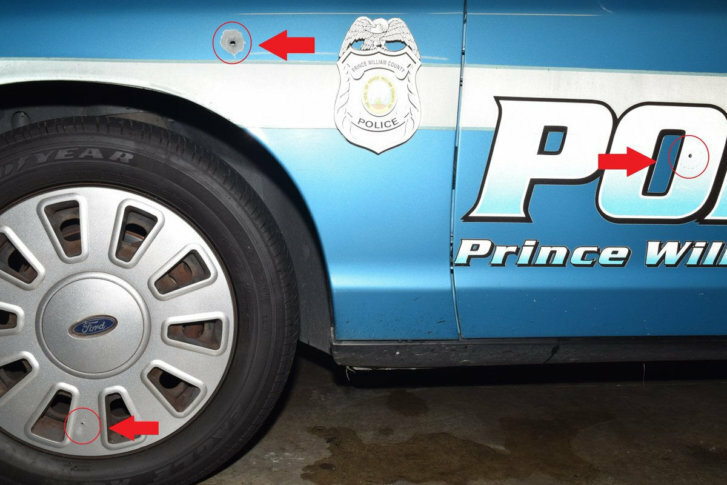 Police on Monday released photos of the cruiser pocked with bullet holes. During the incident, two of the officers returned fire, striking the gunman in the upper body. He was flown to a nearby hospital with serious injuries where he remains. He has has only been identified as a 29-year-old man who reportedly lived at the home where the officers were responding. Both officers were not injured. Police are still investigating what led to the shooting. The officers have been placed on paid leave, which is routine following officer-involved shootings.